At its core, an Apache works pretty much the same way as any other helicopter. It has two rotors that spin several blades. A blade is a tilted airfoil, just like an airplane wing. As it speeds through the air, each blade generates lift. The main rotor, attached to the top of the helicopter, spins four 20-foot (6-meter) blades. The pilot maneuvers the helicopter by adjusting a swash plate mechanism. The swash plate changes each blade’s pitch (tilt) to increase lift. Adjusting the pitch equally for all blades lifts the helicopter straight up and down. Changing the pitch as the blades make their way around the rotation cycle creates uneven lift, causing the helicopter to tilt and fly in a particular direction. We’ll learn more about the rotors and blades next. As the main rotor spins, it exerts a rotation force on the entire helicopter. The rear rotor blades work against this force — they push the tail boom in the opposite direction. By changing the pitch of the rear blades, the pilot can rotate the helicopter in either direction or keep it from turning at all. An Apache has double tail rotors, each with two blades. The newest Apache sports twin General Electric T700-GE-701C turboshaft engines, boasting about 1,700 horsepower each. Each engine turns a drive shaft, which is connected to a simple gear box. The gear box shifts the angle of rotation about 90 degrees and passes the power on to the transmission. The transmission transmits the power to the main rotor assembly and a long shaft leading to the tail rotor. The rotor is optimized to provide much greater agility than you find in a typical helicopter. The core structure of each blade consists of five stainless steel arms, called spars, which are surrounded by a fiberglass skeleton. The trailing edge of each blade is covered with a sturdy graphite composite material, while the leading edge is made of titanium. The titanium is strong enough to withstand brushes with trees and other minor obstacles, which is helpful in “nap-of-the-earth” flying (zipping along just above the contours of the ground). Apaches need to fly this way to sneak up on targets and to avoid attack. The rear tail wing helps stabilize the helicopter during nap-of-the-earth flight as well as during hovering. The Apache’s blades and wings detach for easier transport. You could say, based on all this information, that the Apache is just a high-end helicopter. But that would be like calling James Bond’s Aston Martin just a high-end car. As we’ll see in the next few sections, the Apache’s advanced weaponry puts it in an entirely different class. The Apache’s chief function is to take out heavily armored ground targets, such as tanks and bunkers. To inflict this kind of damage, you need some heavy fire power, and to do it from a helicopter, you need an extremely sophisticated targeting system. The Apache’s primary weapon, the Hellfire missile, meets these demands. Each missile is a miniature aircraft, complete with its own guidance computer, steering control and propulsion system. The payload is a high-explosive, copper-lined-charge warhead powerful enough to burn through the heaviest tank armor in existence. The Apache carries the missiles on four firing rails attached to pylons mounted to its wings. There are two pylons on each wing, and each pylon can support four missiles, so the Apache can carry as many as 16 missiles at a time. Before launching, each missile receives instructions directly from the helicopter’s computer. When the computer transmits the fire signal, the missile sets off the propellant. Once the burning propellant generates about 500 pounds of force, the missile breaks free of the rail. As the missile speeds up, the force of acceleration triggers the arming mechanism. When the missile makes contact with the target, an impact sensor sets off the warhead. Before giving the firing signal, the Apache computer tells the missile’s control system the specific pulse pattern of the laser. The missile has a laser seeker on its nose that detects the laser light reflecting off the target. In this way, the missile can see where the target is. The guidance system calculates which way the missile needs to turn in order to head straight for the reflected laser light. To change course, the guidance system moves the missile’s flight fins. This is basically the same way an airplane steers. The Hellfire II, used in Apache Longbow helicopters, corrects these flaws. Instead of a laser-seeking system, the missile has a radar seeker. The helicopter’s radar locates the target, and the missiles zero in on it. Since radio waves aren’t obscured by clouds or obstacles, the missile is more likely to find its target. Since it doesn’t have to keep the laser focused on the target, the helicopter can fire the missile and immediately find cover. We’ll look at the Apache’s rockets next. Apaches usually fly with two Hydra rocket launchers in place of two of the Hellfire missile sets. Each rocket launcher carries 19 folding-fin 2.75-inch aerial rockets, secured in launching tubes. To fire the rockets, the launcher triggers an igniter at the rear end of the tube. The Apache gunner can fire one rocket at a time or launch them in groups. The flight fins unfold to stabilize the rocket once it leaves the launcher. The rockets work with a variety of warhead designs. For example, they might be armed with high-power explosives or just smoke-producing materials. In one configuration, the warhead delivers several submunitions, small bombs that separate from the rocket in the air and fall on targets below. The gunner engages close-range targets with an M230 30-mm automatic cannon attached to a turret under the helicopter’s nose. The gunner aims the gun using a sophisticated computer system in the cockpit. The computer controls hydraulics that swing the turret from side to side and up and down. The automatic cannon is a chain gun design, powered by an electric motor. The motor rotates the chain, which slides the bolt assembly back and forth to load, fire, extract and eject cartridges. This is different from an ordinary machine gun, which uses the force of the cartridge explosion or flying bullet to move the bolt. The cartridges travel from a magazine above the gun down a feed chute to the chamber. The magazine holds a maximum of 1,200 rounds, and the gun can fire 600 to 650 rounds a minute. The cannon fires high-explosive rounds designed to pierce light armor. In the next section, we’ll look at the targeting system for the cannon, as well as the other major Apache controls. WHO USES THE APACHE, AND WHO MAKES IT? The Apache is the primary attack helicopter in the U.S. arsenal. Other countries, including the United Kingdom, Israel and Saudi Arabia, have also added Apaches to their fleet. The first series of Apaches, developed by Hughes Helicopters in the 1970s, went into active service in 1985. The U.S. military is gradually replacing this original design, known as the AH-64A Apache, with the more advanced AH-64D Apache Longbow. In 1984, McDonnell Douglas purchased Hughes Helicopters, and in 1997, Boeing merged with McDonnell Douglas. Today, Boeing manufactures Apache helicopters, and the UK-based GKN Westland Helicopters manufacturers the English version of the Apache, the WAH-64. The Apache has two cockpit sections: The pilot sits in the rear and the gunner sits in the front. The rear section is raised above the front section so the pilot can see clearly. The Apache cockpit is divided into two sections, one directly behind the other. The pilot sits in the rear section, and the co-pilot/gunner sits in the front section. As you might expect, the pilot maneuvers the helicopter and the gunner aims and fires the weapons. Both sections of the cockpit include flight and firing controls in case one pilot needs to take over full operation. The pilot flies the Apache using collective and cyclic controls, similar to ones you would find in any other helicopter. The controls manipulate the rotors using both a mechanical hydraulicsystem and a digital stabilization system. The digital stabilization system fine-tunes the powerful hydraulic system to keep the helicopter flying smoothly. The stabilization system can also keep the helicopter in an automatic hovering position for short periods of time. On the Longbow Apache, three display panels provide the pilot with most navigation and flight information. These digital displays are much easier to read than traditional instrument dials. The pilot simply presses buttons on the side of the display to find the information he or she needs. We’ll look at the Apache’s sensor equipment next. The Apache Longbow has a distinctive radar dome mounted to its mast. One of the coolest things about the Apache is its sophisticated sensor equipment. The Longbow Apache detects surrounding ground forces, aircraft and buildings using a radar dome mounted to the mast. The radar dome uses millimeter radio waves that can make out the shape of anything in range. The radar signal processor compares these shapes to a database of tanks, trucks, other aircraft and equipment to identify the general class of each potential target. The computer pinpoints these targets on the pilot’s and gunner’s display panels. The pilot and the gunner both use night vision sensors for night operations. The night vision sensors work on the forward-looking infrared (FLIR) system, which detects the infrared light released by heated objects. The pilot’s night vision sensor is attached to a rotating turret on top of the Apache’s nose. The gunner’s night vision sensor is attached to a separate turret on the underside of the nose. The lower turret also supports a normal video camera and a telescope, which the gunner uses during the day. The computer transmits the night vision or video picture to a small display unit in each pilot’s helmet. The video display projects the image onto a monocular lens in front of the pilot’s right eye. Infrared sensors in the cockpit track how the pilot positions the helmet and relay this information to the turret control system. Each pilot can aim the sensors by simply moving his or her head! Manual controls are also available, of course. Next, let’s look at a few of the systems that protect the pilot and gunner during battle. The Apache’s first line of defense against attack is keeping out of range. As we saw earlier, the helicopter is specifically designed to fly low to the ground, hiding behind cover whenever possible. The Apache is also designed to evade enemy radar scanning. If the pilots pick up radar signals with the onboard scanner, they can activate a radar jammer to confuse the enemy. The Apache is also designed to evade heat-seeking missiles by reducing its infrared signature (the heat energy it releases). The Black Hole infrared suppression systemdissipates the heat of the engine exhaust by mixing it with air flowing around the helicopter. The cooled exhaust then passes through a special filter, which absorbs more heat. The Longbow also has an infrared jammer, which generates infrared energy of varying frequencies to confuse heat-seeking missiles. The Apache is heavily armored on all sides. Some areas are also surrounded by Kevlar soft armor for extra protection. The cockpit is protected by layers of reinforced armor and bulletproof glass. According to Boeing, every part of the helicopter can survive 12.7-mm rounds, and vital engine and rotor components can withstand 23-mm fire. The area surrounding the cockpit is designed to deform during collision, but the cockpit canopy is extremely rigid. In a crash, the deformation areas work like the crumple zones in a car — they absorb a lot of the impact force, so the collision isn’t as hard on the crew. The pilot and gunner seats are outfitted with heavy Kevlar armor, which also absorbs the force of impact. With these advanced systems, the crew has an excellent chance of surviving a crash. 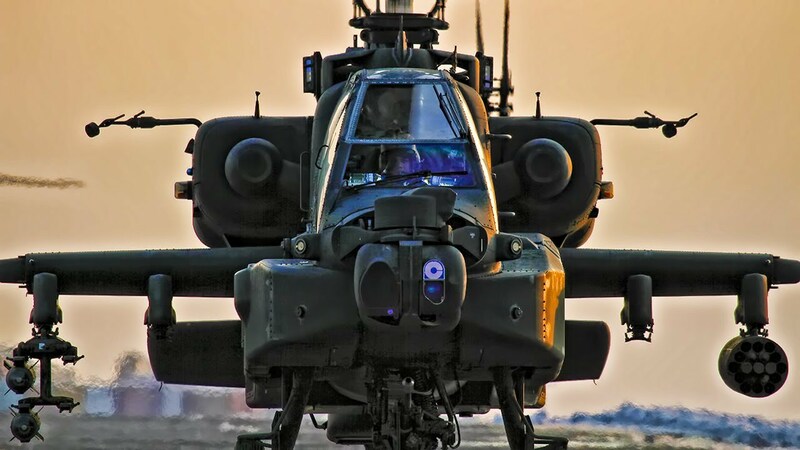 Flying an Apache into battle is extremely dangerous, to be sure, but with all its weapons, armor and sensor equipment, it is a formidable opponent to almost everything else on the battlefield. It is a deadly combination of strength, agility and fire power. For more information about Apache helicopters and other weapons, check out the links on the next page.